Dr. Pathak’s gift should be praised. Almost half (48.3%) of India’s population defecates in the open, including 300 million women and girls. This gift will provide a solution for an entire village in Uttar Pradesh, one of the top states in India in need of latrines. [ WaterAid.(2014). News and media – Lack of toilets reportedly linked to the murder of Uttar Pradesh girls. Retrieved from http://www.wateraid.org/us/news/news/lack-of-toilets-reportedly-linked-to-murder-of-uttar-pradesh-girls] Access to sanitation facilities is necessary for individual, community, and environmental health. Poor sanitation and hygiene can lead to the spread of diseases, such as diarrhoea, cholera, typhoid, hepatitis and parasitic infections, through vector transmission and the contamination of soil and water sources. Dr. Prathak’s gift would improve sanitation for adolescent girls and women, the lack of which is associated with poor menstrual hygiene, leading to the increased risk for pelvic inflammatory disease and reproductive tract infections. Also, inadequate systems for disposal of pads and cloths used during menstruation contribute to an unsanitary environment. 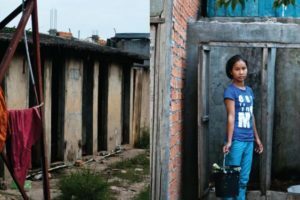 Women who live in rural or poor urban areas, either use public bathrooms, which cost money that many cannot afford, travel far distances, use shared toilets, or relieve themselves in open areas. Without sanitation facilities, 1 in 3 women worldwide risks shame, disease, harassment and are attacked because they have nowhere safe to go to the toilet. [ WaterAid. (2012). Briefing Notes. 1 in 3 Women Lacks Access to Safe Water. Retrieved from http://www.wateraid.org/news/news/take-action-to-support-the-1-in-3-women-without-a-toilet. Women in India reported incidences of men hiding in public latrines at night, waiting to rob or assault those who entered.3 This increase of infrastructure will aid in the reduction of health problems, provide positive impact on the environment, and decrease risk for women in Badaun. Dr. Pathak’s gift provides a solution to the health and environmental concerns related to open defecation; however, it is a short-term answer to India’s widespread problem of violence against women and girls. The main reason for these atrocious acts is not that the girls did not have access to toilets in their homes, but that these girls live in an environment where men feel they have a right and justification to attack them. Even the case of the two teenage girls is still under investigation, with possible evidence that leads to honor killings. The case itself may not be related to lack of private toilets. This is not the first time women or girls have been assaulted or brutally murdered outside of their home. For example, a woman in a nearby district of Uttar Pradesh was gang-raped, forced to drink acid and strangled to death. Another was shot dead in northeast India while resisting attackers. Directly following the attack of the teenage girls, there were at least two more murders of women reported. Women are not assaulted in India because they lack access to toilets. Women are assaulted because somebody assaults them. Building toilets without considering the culture in which these women live, where men feel they have the right and are justified to attack women, only provides a band-aid on a much more ingrained cultural norm of violence against women. While practical protections, such as access to toilets, are needed for women and girls, solely building infrastructure addresses only one aspect of the problem. It ignores the underlying issues of gender discrimination and lack of justice for women. Such measures may remove an opportunity for women and girls to be attacked, but in reality it just displaces the problem rather than solving it. Infrastructure, such as toilets, is not the only solution; it is important to challenge discriminatory legal frameworks, policies, practices and ingrained beliefs that put women and girls at risk for assault. We must be cautious of framing such cases in simplistic manners that usually lead to one-sided responses; consequently masking the problem rather than solving the harder, long-term issues. There is a need to address gender inequalities and inequities when addressing sanitation needs. Cultural norms will not change overnight and we still need to rely on the generosity of people like Dr. Pathak to ensure that women and girls have the right to relieve themselves in privacy and without fear of abuse or death. A lack of political will for ending violence against women, and the veil of silence that shrouds it, especially sexual violence, gives women and girls little voice to demand services that would reduce their vulnerability. Any approaches to end violence against women needs to be attentive to cultural norms and address these cultural barriers. Such approaches need to be multifaceted enabling societal, communal, familial, and individual changes, engaging with women and men of all ages. More importantly, women’s safety should not rely on the promise of private infrastructure such as household toilets, but the freedom to be in public without fear and discrimination.